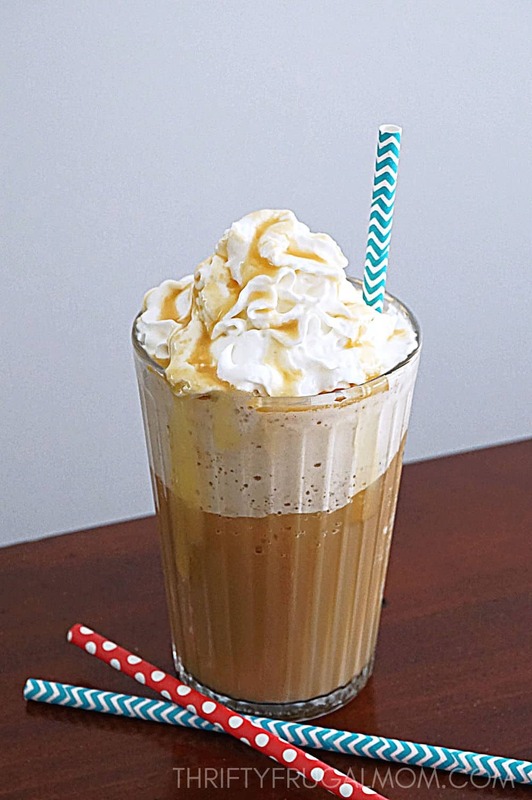 Learn how to make a caramel frappe with this delicious, easy recipe. Not only will this homemade frappe save you money, but it’s also a great way to use up leftover coffee! I am a sucker for beverages, especially coffee beverages. But since I believe that homemade is usually better and since I’m frugal and hate parting with $4 every time I want to quench my craving, I’ve been on a mission to figure out how to make my own homemade coffee drinks that mimic the ones I love at coffee shops. 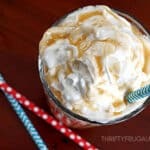 I found a great iced coffee recipe years ago, but up until now, I just couldn’t find a homemade frappe that I truly loved. That changed recently when I discovered the trick of using coffee ice cubes. Suddenly I could make a frappe at home that wasn’t mediocre! In my opinion, the problem with using regular ice cubes to get that slushy frappuccino texture is that it also ends up making the drink much too watery and weak. By subbing coffee ice cubes, you suddenly get a nice, strong coffee flavor- just the way it should be! I’ll warn you though, this homemade caramel frappe recipe makes a very thick frappe. If you want it a bit thinner you’ll probably need to add more milk or brewed coffee. And if you think the coffee flavor should be stronger, feel free to sprinkle in a bit of instant coffee! 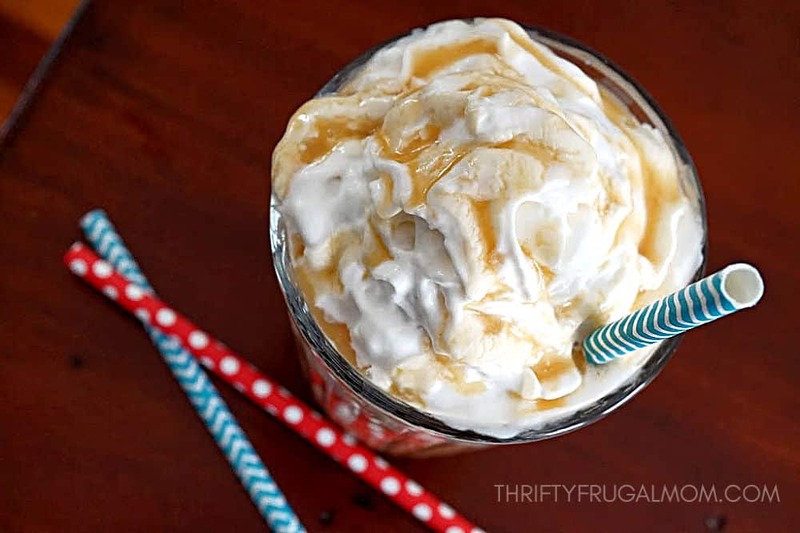 This homemade caramel frappe is super easy, delicious and refreshing! And it's way cheaper than buying one too. Place all ingredients except whipped cream in blender. Top with whipped cream and drizzle with caramel syrup. *** To cut calories a bit, I now sub some of my favorite stevia for part of the sugar. By using some sugar, I don’t notice that unique stevia taste, but still get the benefit of fewer calories. UPDATE: I finally got smart and started defrosting the ice cubes in the microwave for about 45 seconds. I do it just long enough that it softens them a bit, but not long enough to melt them and lose the slushiness that they give the frappe. It works like a charm! I am giddy with excitement to try this recipe! I take it you enjoy coffee beverages as much as I do? Since, I've been making my own frappes, I seriously no longer am tempted to stop at Starbucks. This looks delicious and just happens to be my favorite Starbucks flavor (although I'm also too frugal to pay for them very often). I've heard of freezing the coffee in an ice cube tray before, but I really need to give that a try. It sounds like it would make the beverage much better. Thanks for the recipe and tips. Yes, the frozen coffee makes a HUGE difference! I tried for a long time to make homemade frappes using just ice and regular coffee and it just didn't cut it for me. It also helps if you use good quality strong brewed coffee- give it a much better flavor! I'm going to have to try this out. One question - what is leftover coffee? Just kidding but I love it too much to have any leftover. Sounds like you'll have to make a pot just for this, then! :) Hope you enjoy it. Making myself a homemade frappe has become one of the bright spots in my morning! Thanks for sharing! Caramel isn't my favorite, but I think it would be easy enough to change that part. This will be a perfect surprise for my husband though! I hope your hubby enjoys the surprise, Steph! :) And actually, you might surprise yourself by liking this too. I'm not a huge caramel fan and often avoid it, but I don't find the flavor overpowering in this frappe and therefore like it. 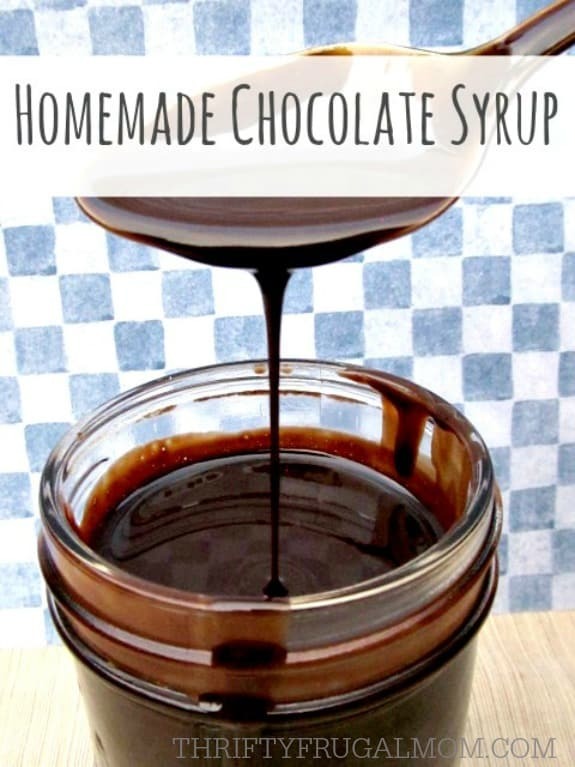 But like you said, you can easily add chocolate syrup instead or tweak it to create other flavors too! Blessings! Oh my goodness, this looks absolutely amazing! Definitely going to try making my caramel frap at home. Making my own frappes at home has been one of my favorite money saving discoveries. Hope you enjoy it as much as we do! Thanks, Tasha! I think it is. ;) And I love that it's simple to make and allows me the chance to enjoy a delicious beverage without shelling out $5! Looks great! I love these! Pinning! Coming to you from #EspressosofFaith via #Mom2MomMondays. OMG... I just made this with chocolate instead of caramel....I will never buy a Frappuccino again!!!!! Thanks! Patrice, thanks for letting me know how much you loved it! Your comment made my day. :) Love that you were creative and made your own version. If you like peppermint, try adding a little bit of extract for a Peppermint Mocha frappe. So yummy! And I have to agree that once you start making these, you just aren't very tempted to buy frappes anymore. Pretty much the only time I buy one now is if I'm out with friends and we are actually at a coffee shop to hang out. YES! I love making my own frappes! They are SO expensive, over 5 bucks up here--yikes. Thanks for linking up to the Friday Frenzy! I know! I haven't bought one in ages because of making my own, but we were away over the weekend and I was craving one so we stopped at a coffee shop and I gulped pretty hard at the $5 price! Mmmm! Love this! Totally need to try! Thanks for sharing on Friday Frenzy Link Party!! It's so good...better than most coffee shops, if I have to say so myself! I love that I can customize it and make it as sweet and as strong (coffee flavor) as I want. Not too late at all! :) Hope you can give it a try soon....I'm pretty sure that you'll love it. I buy Starbucks Caramel frappies at Walmart, $2.50 each, and put them in the fridge. Problem is my kids like em to. This gets expensive, but works good when you're in a hurry. What about making these and storing in the fridge? Like for the week? Will it keep? Yeah, the store bought ones definitely are super convenient! These homemade frappes won't store well in the fridge. They're made to be more slushy and when they melt, it's not that they're gross, they just lose some of their awesomeness. The storebought Starbucks frappes are more like what I would call iced coffee- strong coffee with milk and sugar added and if you like flavoring too. I have a recipe for a delicious one, but don't have it on the blog yet. But if you Google iced coffee recipes, I'm pretty sure you could find a good one. Or if you'd like I can email you the recipe to the email address that you used when you commented. At any rate, iced coffee will easily keep for several days and I love it as store bought frappe substitution. The perfect drink for our date night! No need spend $4 worth of frappe. Thank you! Exactly! Save money and still enjoy a delicious drink. What's not to love? That's a good question. I've never poured into one of the Starbucks' cups before to check, but I think it would actually be in between the two.